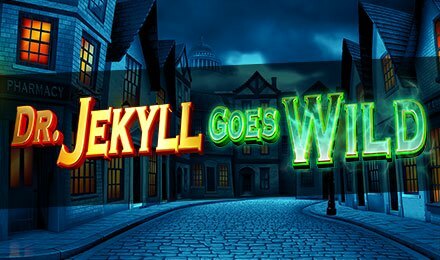 Plunge into the universe of Dr. Jekyll at Moon Games by hitting the reels of Dr. Jekyll Goes Wild slots. This creation of Scientific Games is loaded with features which can only make your gaming experience a better one! This 5 reels, 10 paylines online slot is packed with features. So, why not try your chance by playing this online slot game? Once you’ve clicked on ‘Play’, the many symbols you will come across are: Sand Time, Mr Hyde, Dr Jekyll, Street Lights, Test Tubes, Scrolls, Big Ben, 10, J, Q, K and A. The game play of this game is rather simple. When combinations of 3 or more identical symbols are formed on winning paylines, you are awarded a respective win. You will also find the auto-play option on this game; it lets you choose some game rounds to be played hands free. Bet Levels: You can choose any bet levels from 1 to 10 on this movie themed slot game. Amount of Paylines Selection: TThe number of paylines is fixed, and cannot be changed. Coin Values: The lowest coin value is £0.10 while the highest is of £500.00. There are numerous features on this slot game and you can trigger these by playing the game. You will find wilds and scatters on the reels of Dr. Jekyll Goes Wild slots. When 3, 4 or 5 scatters appear in any position on the reels, the free spins feature is awarded. You can win from 12 to 20 free spins. During this feature, you can win additional free spins when wilds land on the reels. The Big Bet Feature can be selected on Dr. Jekyll Goes Wild slots. You have to select your stake which range from £20 to £50, and you will be awarded 5 linked free spins.